Increasing prefrontal cortex activity with brain stimulation reduces aggressive intent in human adults, according to new research published in JNeurosci. This finding extends previous correlational aggression research by demonstrating the influence of the prefrontal cortex on the intent to commit an aggressive act in a "gold standard" double-blind, placebo-controlled, stratified, parallel-group, randomized trial. Olivia Choy and colleagues randomly assigned adults to a treatment group that received transcranial direct current stimulation of the dorsolateral prefrontal cortex or a control group that received a placebo intervention. Participants in the treatment group showed less intention to commit hypothetical physical or sexual assault and perceived these acts as morally wrong more so than individuals in the control group. 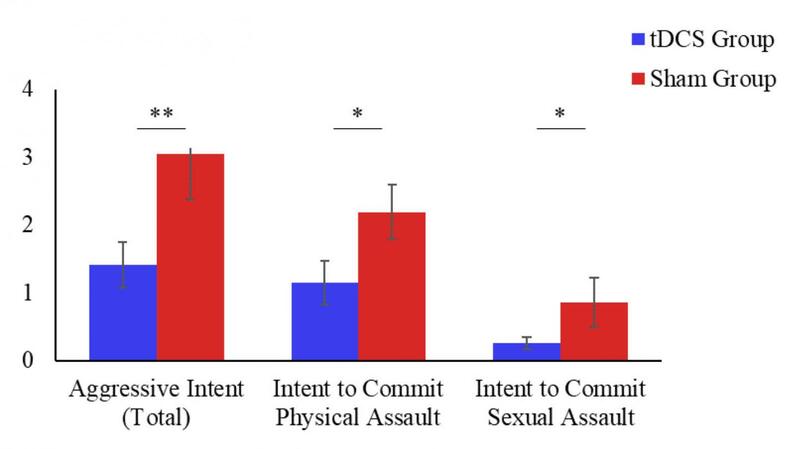 Enhanced moral judgement partly accounted for reduced intent to commit sexual, but not physical, assault. These results suggest that using brain stimulation to reduce an individual's intention to commit an aggressive act may be a first step towards creating behavior change in individuals susceptible to violent behavior. Further research is needed to determine whether violence could actually be prevented by prefrontal upregulation.